Whatever your occasion, we will create for you a fabulous, unique, home-made cake that will be the talking point of your reception or party and taste great too. Tell us what you would like and we will make it. 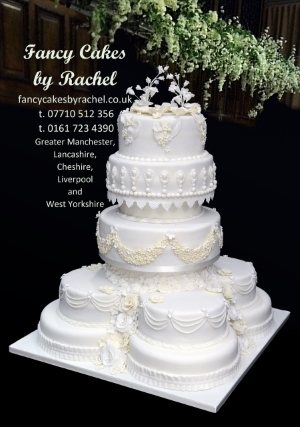 Whether you choose a traditional cake with hand-made sugar flowers, a contemporary design or a themed cake to reflect an interest or hobby, your cake will be your own creation. All our cakes are baked fresh to order. We only use the best quality fresh ingredients so our cakes not only look stunning but taste wonderful too. Please call us on 07710 512 356 or 0161 723 4390 to discuss your ideas and arrange a free, no-obligation consultation and informal chat. Or, use the Contact link to send us a short e-mail with your telephone number and a brief description of what you are looking for and we will call you back.